PLYMOUTH >> It had been years since T.J. Chism celebrated a baseball title. Chism, who spent six years in the minor leagues, was a member of the New York Mets’ Double-A affiliate in Binghamton that won an Eastern League championship in 2014. Chism, the 2006 Daily Times Player of the Year from Sun Valley, earned Top Lumber MVP honors of the Delco League finals after pitching Narberth to two of its three wins in the series. Saturday at Villanova Ballpark in the deciding Game 5, Chism tossed 4 2/3 innings with four strikeouts to help Narberth capture the Charlie Kress Trophy with a 5-2 victory over Wayne. Narberth is the Delco League champion for the second time in franchise history. The plan all along, if the series went the distance, was for Chism to start Game 5. Wayne countered with lefthander Luke Zimmerman, the 2018 Daily Times Player of the Year from Marple Newtown. Zimmerman and Chism opposed each in the opener. Chism was relieved by Joe Ravert with one out in the fifth inning after Dan Williams smacked an RBI single to cut Narberth’s lead to 3-2. Earlier, Kevin Mohollen stroked an RBI triple after nine-hole batter Tommy Jacobs worked a walk. Chism hadn’t pitched competitively since a brief stint with Aston Valley in 2016, but predicts he’ll be a Mudcat come next spring. Narberth delivered on its early scoring chances against Zimmerman. DeBarberie began the second inning with a single, and Spencer Stokes reached on an infield knock. After Mike White was caught looking on strikes, Lake hit one on the ground to the right side, beyond the diving reach of second baseman Williams to give the Mudcats a 2-0 advantage. “I kind of surprised myself a little,” Lake said. Lake, who is the athletic director at Bonner & Prendergast, hired DeBarberie to take over the baseball program in the spring. 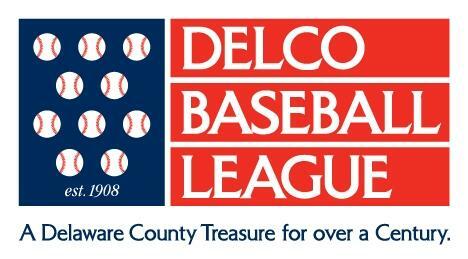 Lake plays for DeBarberie in the Delco League among nine Bonner alums on the squad. It’s a unique and reciprocal player-coach-boss relationship. Lake finished the series with four hits, five RBIs and two runs scored. After Lake’s two-run single, Zimmerman unleashed a wild pitch, allowing pinch runner Mike Coleman to score from second with a headfirst slide to put Narberth in front, 3-0. Zimmerman would settle in and at one point retired 10 straight batters. Wayne manager Brian Fili pulled Zimmerman with one out in the seventh. Zimmerman, who is bound for Saint Joseph’s, gave up four earned runs on four hits with seven strikeouts. Luke Cantwell delivered a two-out, two-run single in the seventh off James Dougherty to give Narberth some insurance. Moments later, Cantwell made a spectacular diving catch in center for the game’s final out. In relief of Chism, Ravert retired all eight batters he faced. Mohollen, the 2014 Daily Times Player of the Year from Strath Haven, had a tremendous series for Wayne. The University of Delaware senior was 8-for-12, including 2-for-4 with an RBI and a run in Game 5. NOTES >> Twelve runs were scored in just shy of three games at cavernous Villanova Ballpark. Meanwhile, in two-plus games at Narberth Playground, 34 runs were tallied. ... Wayne hasn’t won a Delco League crown since 2015. It owns a league-record 15 championships. 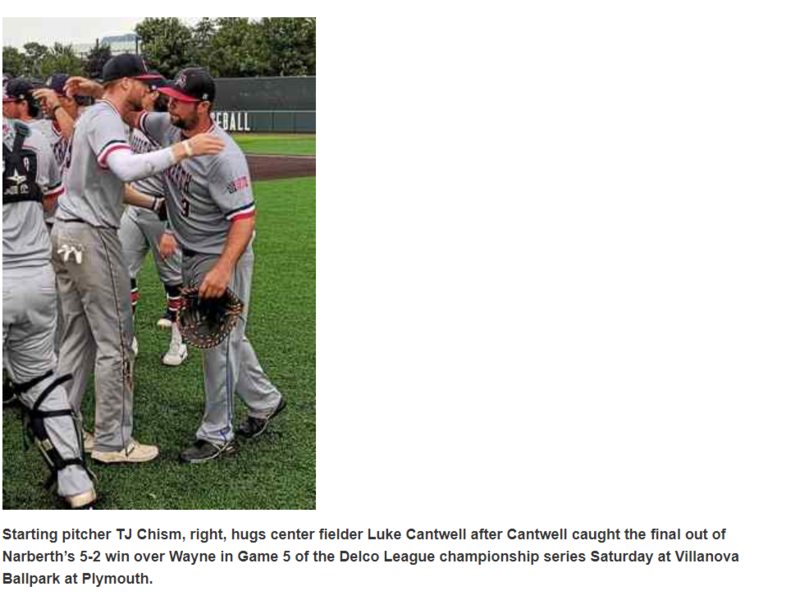 PLYMOUTH >> By the time the trophy made its way to Luke Cantwell Saturday evening, the outfielder had plenty of practice for the moment. 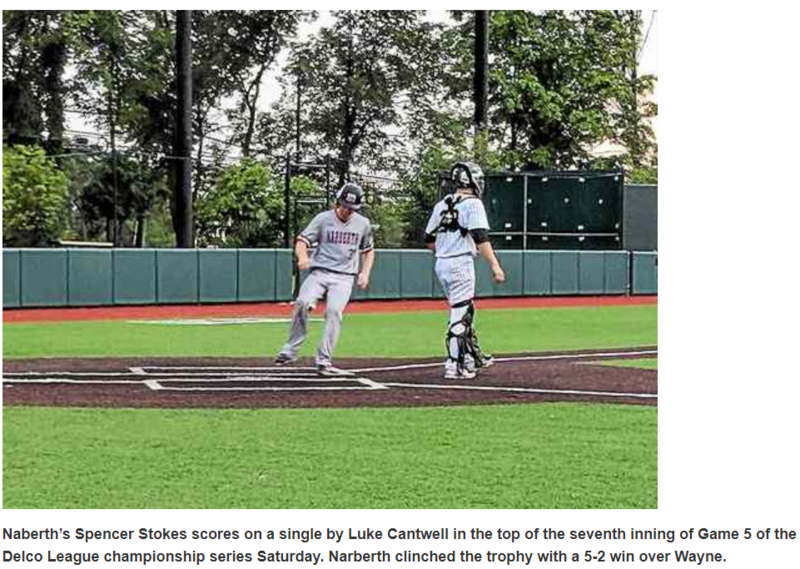 So far in the spring/summer of 2018, the recent Marple Newtown grad has lifted a Central League crown. He led the Tigers to the PIAA Class 5A title, a first for a Delco school, in June. 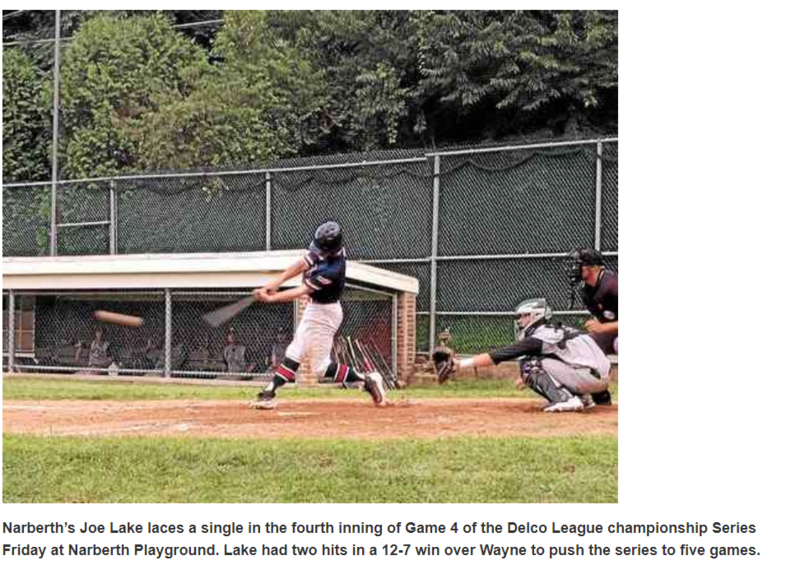 July saw his Broomall-Newtown legion team notch a district title. Before Cantwell starts his baseball career at West Chester University, he made sure to add a Delco League title Saturday. 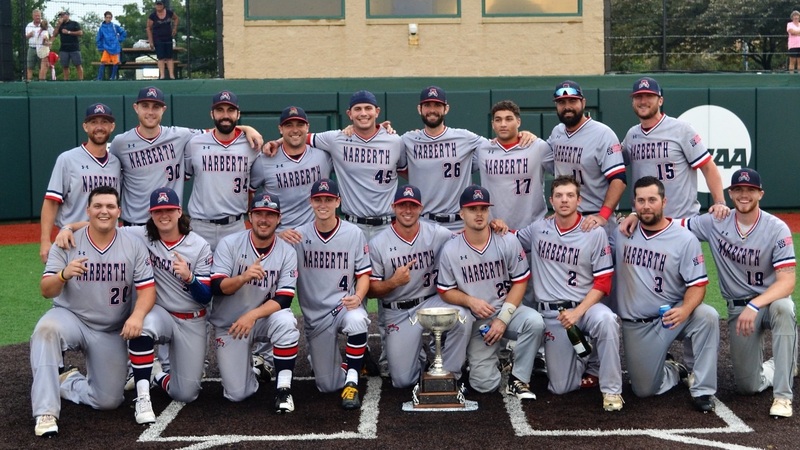 Cantwell was one of Narberth’s bevy of contributors in the championship series, which ended on a 5-2 win over Wayne, clinching the decisive Game 5 to earn Narberth’s second championship in three years. Cantwell was at the center of it Saturday. He provided insurance in the top of the seventh with a two-run single to open up a 3-2 game. And the final out of the game found its way naturally to his glove, a diving catch in center on Matt Briner’s fast-fading liner. Cantwell caught the continuation of Game 3 Friday at Narberth Playground, then switched to the outfield in Game 4, a 12-7 win sparked by his first-inning home run. An outfielder by trade, Cantwell likewise donned the catcher’s gear for the betterment of Marple Newtown this spring, shoring up a weakness of the defending District 1 champs. He possesses frightening potential in the outfield, with his rangy frame, power bat and deceptive speed. And it’s not a coincidence that Cantwell repeatedly finds himself on winning teams. That includes a veteran Narberth side where it takes a special player to contribute so early. Both sides of the game featured Marple Newtown contributors. Luke Zimmerman, the starter in Marple’s state final win who provided the walk-off hit in the 10th inning, got the ball for Wayne. He allowed three runs in the second inning, the big blow a two-run single by nine-hitter Joe Lake and a wild pitch that allowed courtesy runner Mike Coleman to sprint around from second. But he recovered to retire 10 straight batters, exiting only after a walk and a strikeout to start the seventh. The base on balls, issued to Spencer Stokes, resulted in a run when Cantwell greeted reliever James Dougherty with his single. Only one of those Marple Tigers could add to his summer haul of accolades, though. And Cantwell made sure he and his Narberth mates got it done. Top Lumber Finals MVP TJ Chism talks about the series and pitching his team to two road victories in the series. 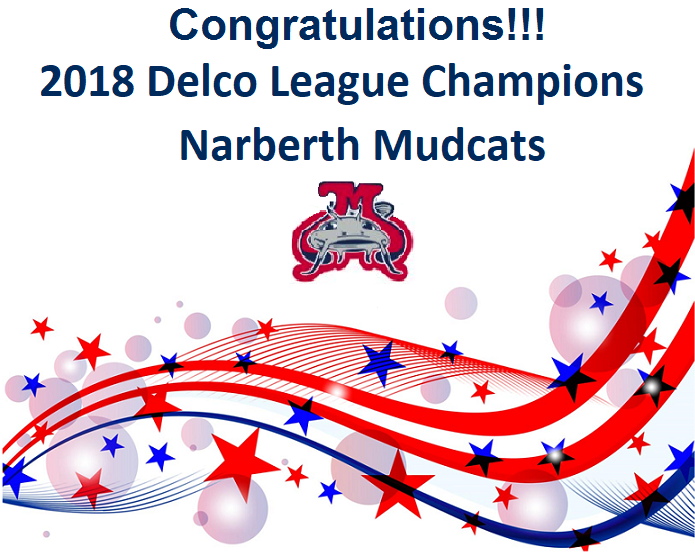 Congratulations Narberth Mudcats 2018 Delco League Champions!! NARBERTH >> It took about a half hour Friday for Luke Cantwell and Narberth to be truly pushed to the brink. Cantwell strode into the box in the seventh inning of Game 3 of the best-of-5 Delco League championships series, suspended from Thursday night, as the potential go-ahead run with two outs. He ripped a comebacker off the mound of Wayne closer Tom Cockill that the lefty recovered and tossed to first to get the final out of an 8-6 Wayne triumph. By the time Cantwell next dug in, in the bottom of the first in Game 4, Narberth already faced a two-run deficit, courtesy of an Eddie Paparaella home run. It had been since Tuesday night, two losses and two suspensions ago, that Narberth had mustered so much as an extra-base hit. In one swing, Cantwell rectified that. 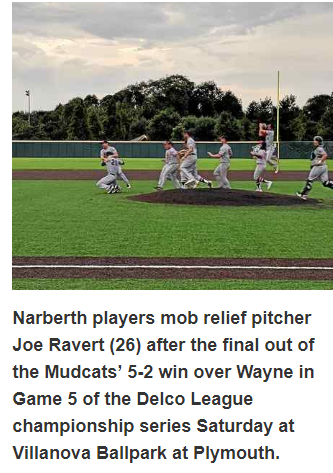 The Marple Newtown All-Delco clubbed a solo home run, igniting the slumbering Narberth bats to a 12-7 win in Game 4 to even the series at two games apiece. Weather permitting, Game 5 will be played at Villanova Ballpark at Plymouth Saturday afternoon at 4. Cantwell — who caught in Game 3, then patrolled center in Game 4 — made the adjustment against Cockill. He fisted a curveball in his first encounter. Then when he worked the count full in Game 4 against Cockill, with whom manager Brian Fili started, he waited for that hook, and atoned. 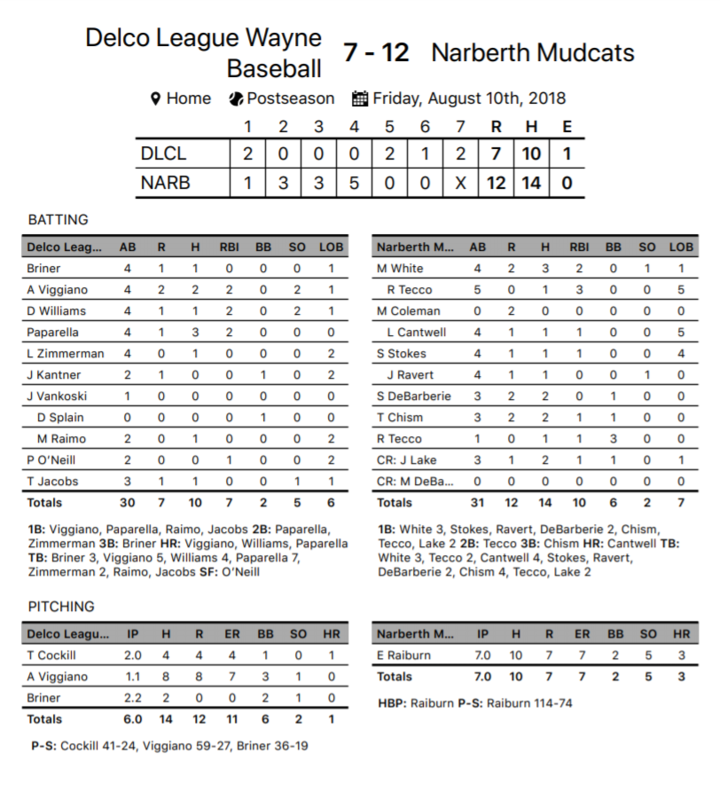 That opened the floodgates for Narberth, which was shut out in Game 2 (stretched across Tuesday and Thursday) and stitched together just six singles in Game 3. They plated runs in each of their first four trips to bat in Game 4, batting around in the third and fourth innings. That made for an early exit for Cockill. The Lock Haven grad did the job in Game 3, though, inheriting a messy 8-5 lead with runners on the corners and one out. He relented a sac fly to Spencer Stokes, but escaped further damage, content to trade an out for a run. He allowed two singles in the seventh but reared back to strike out pinch hitter Brian Meagher and got Cantwell by the narrowest of margins at first to close out the win. Cockill lasted just two innings in the nightcap, the big blow a two-run double by Richie Tecco in the second. Narberth’s bats piled on Anthony Viggiano for eight runs (seven earned). Stokes and Mike White rapped RBI singles in the three-run third. White and Ryan Tecco added RBI hits in the fourth, aided by a passed ball and a run-scoring error. It was more than enough run support for Evan Raiburn. Manager Steve DeBarberie called on Raiburn two years ago to pitch Game 4 against Wayne, the hard-throwing righty winning with the series on the line. That year, the Mudcats lifted their first championship trophy. This time, Raiburn wasn’t as sharp, but he was perfect for the task. A quick worker with impending darkness threatening a third suspension of the week, he pumped in strikes. He gave up three two-run homers — to Paparella, Dan Williams and Viggiano — but he pitched to contact and got the job done. 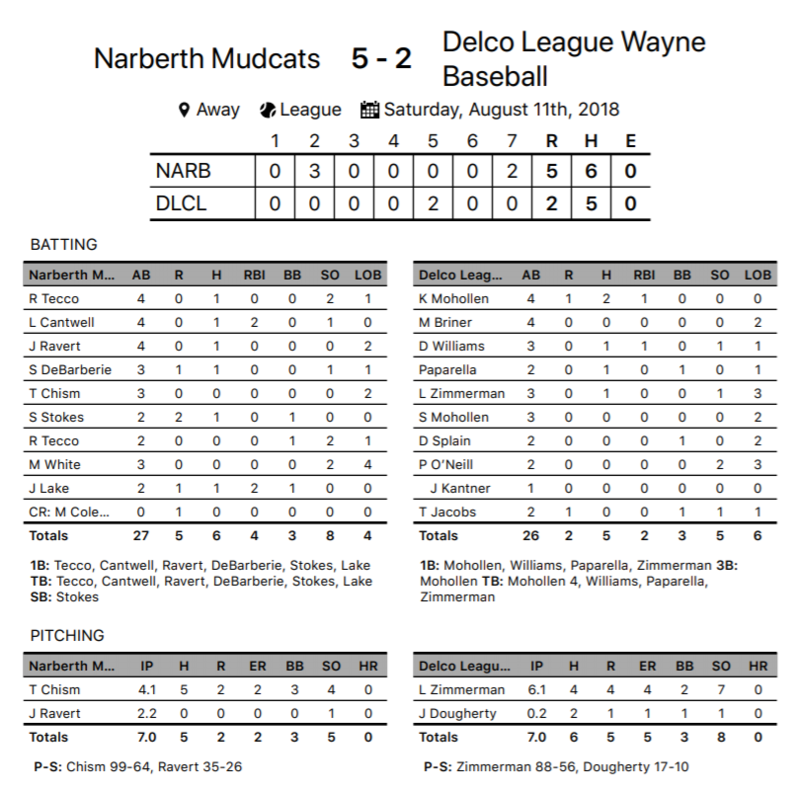 Narberth led 12-2 by the time Viggiano poked his homer to left in the top of the fifth, and the potential tying run for Wayne never got near the plate. The chaotic scheduling has facilitated two major swings in the series. 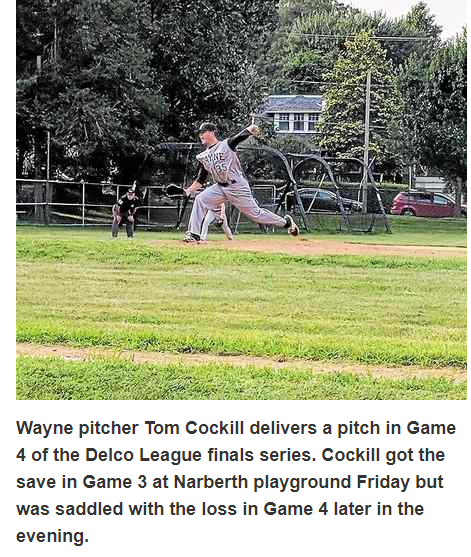 Narberth took Game 1, but then saw Wayne clinch two games on Narberth’s home field. The Mudcats hit back Friday, setting up the winner-take-all Game 5 that most would’ve predicted — and just about all would’ve hoped for — at the beginning of the finals.